Cardio and strength training customized by your own heart! Take your workouts to the next level with heart rate training! During our Heart Zones classes, participants wear provided heart rate monitors on their forearms or upper arms while their trainer actively guides them through a machine-free workout that focuses on cardiovascular fitness, but also improves your functional strength and mobility. Real-time, personalized feedback is displayed constantly on the Big Board, providing both critical information to the trainer and motivational feedback to the trainee. Heart Zones classes are held in the "clubhouses" located at our Des Peres and St. Charles locations. Bathrooms, changing rooms, and a spot for your gear are available. The cost for each class is $11. Active-level Fleet Feet Running Club members save 15% on all FFRC services. An unsolicited testimonial from a first-time Heart Zones trainee: "Took the Heart Zones class tonight at the St. Charles store. Walking in, I had no idea what it was about (in fact, I thought they were just going to tell me about heart zone theory, etc). Boy, was I ever wrong. That class was great, and so was the instructor. I have cut back dramatically on my running because my right leg hurts every time I run - it’s just not fun like it used to be. I was thinking about PT, but now plan to go with a combination of Heart Rate Zones and Functional Strength classes before I take that next step. Thanks for offering such great classes." 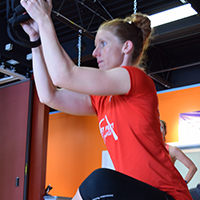 Fleet Feet Running Club Manager Brandi Barbre has more than a decade of experience coaching athletic performance, prescribing corrective exercise, and conducting metabolic testing. Her dedication to delivering a curriculum of proven, scientifically-designed, and full-spectrum training options to Fleet Feet clients has led her to develop a team of trainers and therapists that is second to none. If you would like to join the Fleet Feet Running Club team, please send your resume to Brandi at ffrc@fleetfeetstlouis.com.